SANTA CLARA, Calif.--(BUSINESS WIRE)--SoundHound Inc., a pioneering company in sound recognition and search technologies, launched a new version of its music search, discovery and play app today. Evolving beyond its trademark music and sing/hum identification, SoundHound has developed into the gateway to all-things music, with a modern and intuitive design, unrivaled features and content to continually delight users. This marks SoundHound’s most significant visual change to the app, which has been used by more than 230 million mobile users around the world. The update is available for iOS and Android mobile devices, globally. The new SoundHound offers a more intuitive user experience, allowing quicker search access with a colorful look and dynamic listening screen animation, and new and richer content. Additionally, the home screen can now be scrolled to explore personalized search history, discover what's popular, listen to music on the rise, and more. The redesign also has been optimized for iPhone 6 and iPhone 6 Plus devices. Improved navigation: Vertical scrolling and horizontal swiping makes it easier and more natural for users to find and engage with content. Content at forefront: Users can naturally find and immerse themselves into richer content at the forefront, including access to new songs, “Your History,” videos, charts, featured albums, social media posts, music maps, and more. 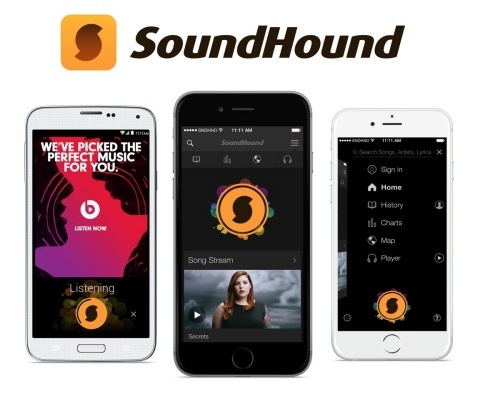 Free and unlimited usage, and content cards: SoundHound continues to provide unlimited usage for free, supported through advertisement integration. The new SoundHound design enables compelling and relevant content and features to appear dynamically, making sponsored content immersive through native content cards, video integrations, and more. Beats Music integration on iOS devices: Users can find new artists and songs they love, and with one tap within SoundHound, launch Beats for music streaming. The addition of Beats Music brings an added value to users, who can launch the streaming music platform from within SoundHound to make finding and consuming new music seamless. In addition to Beats Music, users can also find and explore music amongst all of the major music platforms, including Spotify, Rdio, iTunes, YouTube, Pandora and more inside the app experience. SoundHound 6.3 is available for free download via the App Store and Google Play. SoundHound Inc. is a pioneering company in sound recognition and search technologies. Its unmatched portfolio includes the world's fastest music and audio recognition, the world's only singing and humming search, instant-response large-scale speech recognition systems, and automatic lyrics alignment, LiveLyrics™. The SoundHound mobile application is the only app in the world that enables two distinct sound inputs to be recognized through a single search button. Both recorded music and a hummed query can be identified, delighting users with the magic of capturing a song or finding a song through singing it. SoundHound technologies are deployed globally through carrier, device manufacturer, and automotive partnerships. SoundHound's applications, available on all major platforms, have been downloaded by more than 230 million users. SoundHound Inc. launched a new version of its music search, discovery and play app today for iOS and Android devices. The redesign also includes added Beats Music integration for iOS users.